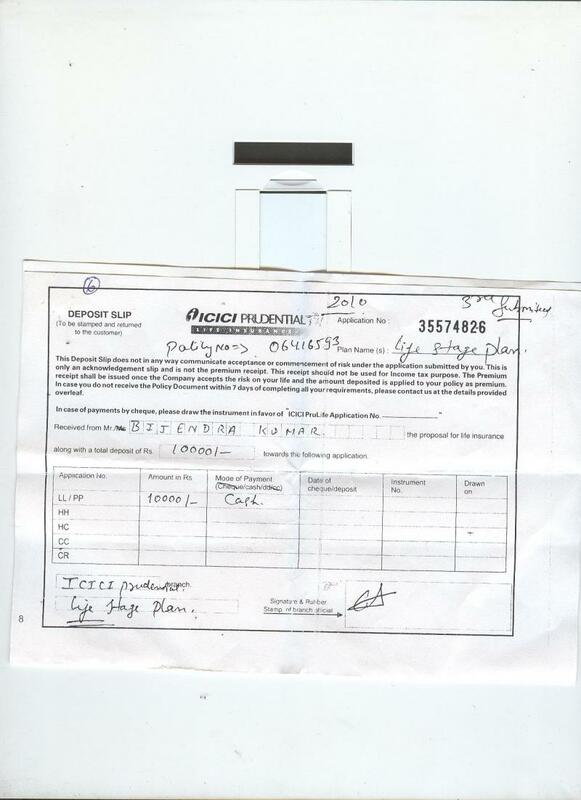 I have taken ICICI Prudential Life insurance (Policy No- 06416593) of Rs 20,000 annually. I have deposited Rs 10,000/- dt 05/02/2010 with ICICI agent Mr Gursaran (9780818989) and Mr Ashish (9646541769) from Ludhiana Sales division (L2, feroz Gandhi Market Ludhiana, Branch. Ph No 0161 5081015). I was given an aknowledgment from Mr Gursaran and Mr Ashish. (scan copy attached) during their visit and collected the money from my end (Application No 35574826). But when i have contacted the branch regarding withdrawal of my money, it was told that the money has not been deposited into my account. Also when i visited the branch on 18/11/2010 Mr Gursaran was present in the said branch and he himself acknowledged that he along with Mr Ashish has taken the money from my house in front of all the employees of L2 Ludhiana Branch. Now icici customer care is saying me that receipt is not valid. I am attaching proof as scan copy of reciept i got from icici agent. ICICI is responsible for this fraud and must take responsibility. Prefer a legal notice on ICICI Prudential and wait for their reply. If they say they are not responsible file a criminal complain of cheating under IPC Sec 420. Tue, 24 Apr 2018 club"factory"customer"care"Helpline"No 9064068835"
my accounted totaly debited. i check customer care. he told "ur account is close. so ur amount is debited". after i ask customer care "why my account is close". he check & say "sorry sir no information account closing detail give you" but my side totally mistake. so "u check in near branch sir". me " ur customer care interfication number 171773053. why i am check nearest branch. i am already. so u recovery my account " refund my amount in my account immediately. or i am going to consumer court. this is full & fully ur mistake. so please clear. i am waiting for your reply. (23)you need population inside your church (24)you want to get your relationship or marriage back. My Name is Rohit Anand, living in H.no 770 Kunde Walan Ajmeri Gate New Delhi 110006. I had order 1 mobile of BBM Q10 4 months old Price 8000/- from Pune location on 14th of July 2015. As per seller Mr.Ranjeet from Pune City going to deliver the phone on 2nd day, but he did not send the phone. And have already paid the payment in his account dated 14th July 2015 (Proof Attached). I am trying to reach him time and again for the docket number, but he�s not answering the call. Now I am sure his intention is not to deliver the phone. Please log a FIR against him. sir,bangleru ki ASPVERVE WELLNESS Jo nagar ki company se online ceragem bed ki booking karai,but Aaj 2month se jyada time ho gaya company na hi bed bhej rahi h aur na hi mera payment.aur mene police complain ka bola,to kah raha h mere ko kisi se Dar nahi lagta,chaho janha compliant Karo..
We are sorry to hear your experience. We have taken a note of your issue. Someone from ICICI Prudential will get in touch with you within the next four hours. Not satisfied with the..ICICI PRUDENTIAL AGENTS FRAUD..